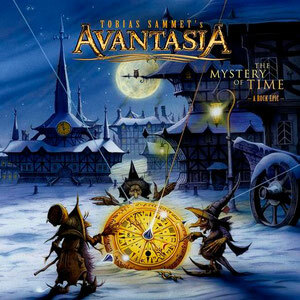 Cover artwork for on AVANTASIA's new album "The Mystery Of Time" was revealed. The album cover artwork was hand-painted by world acclaimed British fantasy artist Rodney Matthews (Thin Lizzy, Asia, Nazareth, Magnum). Guests on "The Mystery Of Time" rock opera include: Joe Lynn Turner (ex-Rainbow, ex-Deep Purple), Eric Martin (Mr. Big), Ronnie Atkins (Pretty Maids), Biff Byford (Saxon), Michael Kiske (ex-Helloween, Unisonic), Arjen Lucassen (Ayreon, ex-Vengeance), Bruce Kulick (Grand Funk Railroad, ex-KISS, ex-Meat Loaf), Russell Gilbrook (URIAH HEEP), guitarist/producer Sascha Paeth, and the German Film Orchestra Babelsberg. The Mystery Of Time will be released on March 30th. Japan limited edition will be available on amazon Japan on March 27th.